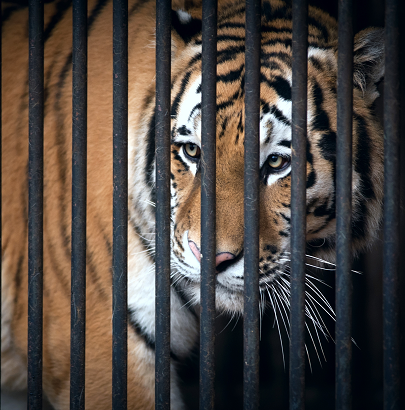 Big cats in captivity that are bred for private ownership often sadly find themselves facing a variety of horrible fates: abandonment, deplorable living conditions, canned hunts or ending up in the illegal wildlife trade. When we refer to big cats “in captivity” or “privately owned” big cats, we are not referring to accredited organizations such as zoos. Nor are we referring to sanctuaries or rescues, who take in abandoned big cats who have no where else to go. A legitimate sanctuary does NOT allow public handling and does NOT breed big cats. Big cats should never be bred for any purpose except for species conservation by accredited parties. Big cats belong in the wild. They should never be domestic pets. It is estimated that over 10,000 big cats like tigers and lions are privately owned in the U.S. alone. Big cats are sometimes bred simply because people want them as a pet but more often they are bred for commercial use, such as roadside zoos that charge the public money to take pictures with big cat cubs. Often the cubs are taken from the mother at a very early age, depriving the cubs of proper nutrition and socialization. Once these cubs get bigger a couple things happen: they lose their value to their owners because it’s no longer safe for the cats to interact with the public and they become much harder and expensive to care for. Many big cats, whether they were initially bred for commercial use or bought as a pet, end up: abandoned, sold on the black market for canned hunts or body parts, living in horribly small living conditions and/or are inadequately fed. Not only is this treatment inhumane to these magnificent creatures, but private ownership also poses a public safety risk. Exotic cats are wild cats and even though they may be raised around people, they will always inherit a predatory instinct. They can easily injure and kill people. In the U.S. alone, there have been hundreds of attacks in the past couple decades. “The only way to stop the abuse of big cats in captivity is to ban private ownership” –Big Cat Rescue. Please take a moment to read this article on Big Cat Rescue’s website. It does a great job listing the reasons why regulations under which big cats are kept just do not work. There is no nationwide law that prohibits the private possession or breeding of big cats. That needs to change. The Big Cats and Public Safety Protection Act proposes to do just that. You can sign the petition in just a couple minutes! You can visit IFAW’s website to learn what states currently have bans. This link also has a map and list of dangerous and deadly incidents involving captive big cats. Big cats that are privately owned pose a huge public safety risk, evidenced by this list. Big Cat Rescue also has a wealth of information documenting big cat attacks and that page can be viewed here.